The chapter starts exactly where the past one left off; with Tahomaru being thankful to Hyakkimaru about how he saved his retainer and the villagers. Dororo then takes the opportunity to explain who is Hyakkimaru, what he does, plus charging some money! For having saved that man. Tahomaru agrees and gives to the little one some coins and indication on where the nearest town is, or to be more exact a city. Before leaving, Tahomaru ask for the name of the Ronin, which answers with “Hyakkimaru”. 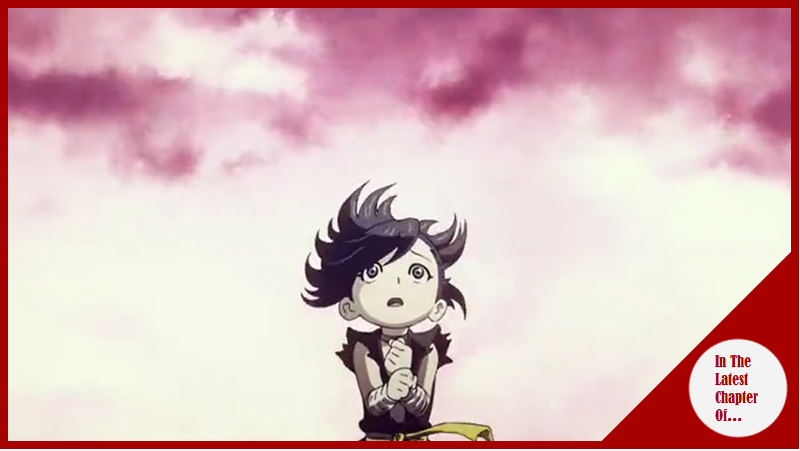 Our heroes have reached the city and Dororo is eating like there is no tomorrow until he hears about a play, one about the Daimyo Daigo and how he overthrown the demons using the power of the Goddess of mercy and, because of that, bringing prosperity. Meanwhile at the domains of the Daimyo, Tahomaru has reached home and his retainers give the report to the owner of the land, their report is what he suspected… That man they meet is Daigo´s objective… While hearing, the Mother is glad that her first born is still alive and well, she prays ti the goddess of mercy and her prayers were heard. Still, she has something to say to her lord, that maybe, this time they are paying for their crimes… The crime against nature they made 16 years ago. Daigo shuts her up, but his wife keeps talking about how the famine is coming and how the other clans are watching them. Daigo shuts her up again and says that she doesn´t know politics and leave. Back with Dororo and Hyakkimaru, they are watching the play and the story in how Daigo killed the demons, in the crowd, Dororo is able to see the blind Monk. After the play, Dororo tells the monk about the final destinies of Mio and the orphans. After that they start talking about Daigo and how he supposedly killed the demons, Dororo think he was like Hyakkimaru; in any case, the monk will go where the graves of such malevolent beings are…Doroor is not interested in dead demons, but the living ones! To kill them and get Hyakkimaru´s body back! Before leaving, the blind monk watches the Ronin and says that he can see that Hyakkimaru has killed humans too. After doing some tourism, Dororo is ready to leave alongside Hyakkimaru onto other part. Our heroes reach a spectral place, the dead bodies of Samurai can be seen and only a wall has been made. Hyakkimaru and Dororo starts checking the other side of such wall, the bandon, soon they are stopped by a kid who tells them that this barrier is the division between life and death. That place was a village and the Bandon was put in the half of the village, in order to protect his side of the land against the Asakura clan. The kid tells that his mother was on the other side and he just wants to go to her side… Besides, at night ghouls and demons appear in here. After eating, Dororo decides to help the kid! As payment for the food he gave them! The night has come and the ghouls are about to come, Hyakkimaru can feel the tremendous power that its coming… A kyubi, a fox demon… The ronin starts attacking the creatures! Dororo start helping him! Due to the nature of casualty, the kid is captured by the Asakura clan. Dororo detecting that he goes on his search. Meanwhile with Hyakkimaru, the flames have been joined and the demon shows their true nature. Hyakkimaru has some difficulty defeating it until some arrows comes and chase off the demon! Meanwhile Tahomaru is investigating in the town, and he finds a crazy lady who is chanting to a fake baby, he ahs cornered her and the crazy woman says about Hyakkimaru´s beginnings, Tahomaru is about to connect the dots. The relief coming from the end of the fight is short since now Hyakkimaru is in front of the one who started it all; the Daimyo Daigo, his Father and the one who sold his body to the demons. In another part…The blind monk has found the hall of hell… He now knows that everything on this place is wrong. A perfect match for last week´s chapters, and pretty much the confirmation that this story is getting to it´s climax, at the very least this arc against Daigo, the Daimyo. I am saying this since most of the important points towards Hyakkimaru´s obscure origins are being revealed, in the sense that Tahomaru is about to uncover the truth about his brother, the Mother now knows that her first baby is still alive; and Daigo now has found such bothersome creature that is messing with his way up to the power. Talking about power, it was confirmed pretty much now that Daigo doesn´t actually care about the people living on his domains; but just the political power he can obtain by having an evergreen region, the happiness and wellbeing of them it’s a very coincidental matter. Now… Everything points out that a clash will come between Daigo and Hyakkimaru, a violent clash and most likely tragic will occur… And I can´t wait to see it!